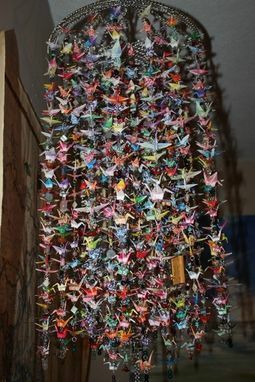 1000 Paper Crane Mobile - each paper crane is hand-folded, pinned and hung with rings and semi-precioius stones. I use origami paper, but also try to get my hands on anything that will fold well - beer bottle labels, tea bag wrappers, cigarette carton inserts...anything! I then attach it to a base, almost like a chandelier, made with chainmaille so there are places to hang the "crane chains" from. 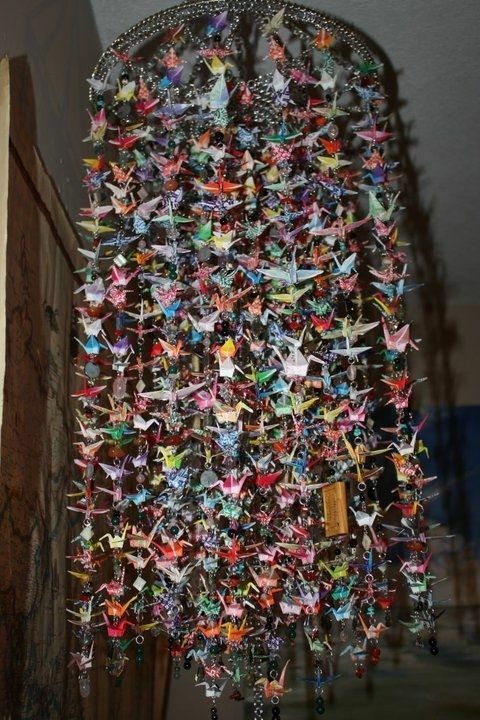 The first one I made took me 7 months to create, in between work and play - I managed to fold about 40 cranes a day, and stringing them was a laborious process. I cried when the project was completed and hung up! So much energy and love was put into the creation of it! It looks fantastic hanging anywhere indoors (I'm working on a way to make them good outdoors, too) - and catches sunlight beautifully.